Last Sunday, February 15, was the February meeting of the Chicago Food Swap As I trudged through the snow, wind howling around me, on my way to the Fearless Food Kitchen in the Broadway Armory Field House, I suddenly remembered that the 2014 February Chicago Food Swap took place in similarly bad weather. Note to self: perhaps skip February next year? But then again, February will always be cold and blustery in Chicago. We can stay inside and hibernate or we can persevere, refusing to let the chill keep us away from friends and the things we love. For the brave souls who ventured out to the February 2015 Chicago Food Swap, the food and fellowship they found at the Fearless Food Kitchen made the journey worth every frozen, snowy step. We welcomed back many returning swappers, including some who were returning after long absences, and greeted a handful of first-time swappers. Several people noticed that there seemed to be fewer sweets on offer than usual. In fact, I struggled to find a treat to bring home to my kids to make up for my absence all afternoon. No cupcakes? No cookies? Luckily, a couple of new swappers brought soft, chewy homemade caramels and returning swapper Lori brought gooey cinnamon rolls dripping with icing, both of which I managed to snag. Whew! I also saw some beautiful truffles from another new swapper, which I missed sadly, and there were two kinds of flavored popcorn, but that might have been all for the sweets. Such a departure from the typical swap! So, what did people bring? Savory items, of course! Things like tamales, soups, tofu, dips, granola, almond milk, savory baked goods like buns and muffins, and salads. Plenty of canners brought food in jars from Meyer lemon marmalade to sweet pickle relish to caramelized pickled onions. There were pantry items galore from flavored salts and spice mixes to mustards to vinegar and crystallized ginger. There was even booze in the form of cranberry vodka and strawberry basil rum. But the most surprising trend seemed to be toward meat. From new swapper Chris’s ham-and-cheese bread, to veteran swapper Lori’s smoked drum sticks to charcuterie expert Giuseppe’s sausages, made from a family recipe. What an interesting development! As I announced at the swap, next month will offer something different: the March Chicago Food Swap will take place at The Chopping Block, Chicago’s premier recreational cooking school located in the Merchandise Mart. 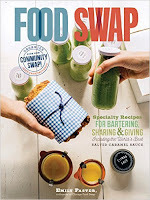 This will be CFS’s third time at The Chopping Block and these swaps are always so much fun. The Chopping Block has a beautiful space and the staff are the most gracious hosts. Swappers even get a 10% discount at the retail store on the day of the swap! That’s dangerous. So sign up for the March 15 swap at The Chopping Block. Registration is now open. We will not beware of the Ides of March and while we will be around a lot of sharp knives, I am confident that no one will end up like Julius Caesar. They were so accommodating and I was truly impressed. It is such a comfortable environment. For a buffet, it was delicious food. Alcoholic beverages at NYC events were also great. Overall, this place is great, and my favorite venue in the city.